The M26 Pershing was deployed rather late onto the battlefields of WWII, with the first 20 landing in the Belgian port of Antwerp in January 1945. These tanks would be the only Pershings to see combat in World War Two, spread between the 3rd and 9th Armored Divisions, part of the First Army. The tanks drew their first blood in late February 1945 in the Roer river sector (not be confused with the Ruhr), with a famous duel taking place in March at Köln (Cologne). The M26 Pershing was a much-needed boost to the fighting capabilities of the American armored units. The nemesis’ of the “good old” M4 Sherman, the Panthers and Tigers, were no longer untouchable foes. The M26’s powerful 90 mm (3.54 in) gun was a nasty surprise to these dreaded Axis vehicles. The M26 would, however, still come to struggle against the newer threat of the Tiger II or “King Tigers” dug into the heartlands of Germany. 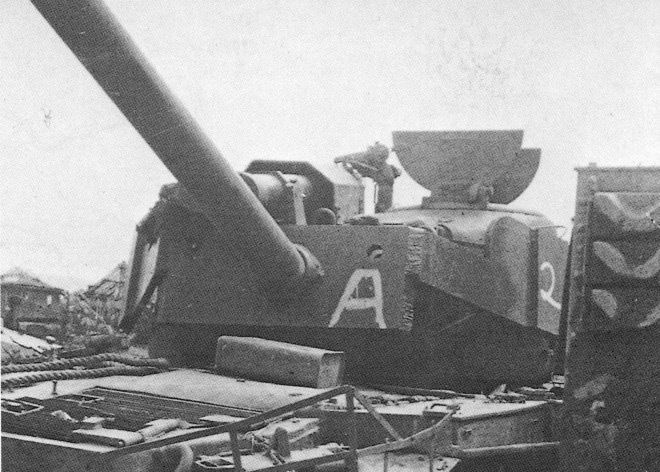 As such, it was decided to up-gun the M26 by installing a more powerful 90 mm cannon, the T15E1. This vehicle was based on the first T26E1 vehicle. After trials at Aberdeen proving grounds, it was approved and redesignated as the T26E4 Pilot Prototype No.1. A single tank was then shipped to Europe and was attached to the 3rd Armored Division. Another prototype was produced, testing the T15E2 gun, using a T26E3 vehicle as a basis. These two prototypes had two recuperators on top of the gun, in order to help manage the stronger recoil of the gun. The second prototype, with the T15E2 two-piece ammunition gun, was the basis for the T26E4 production vehicles. In March 1945, a limited procurement of 1000 T26E4s was authorized, replacing the same number of M26 Pershings ordered. However, with the end of the war in Europe, the number of T26E4s ordered was reduced to 25. These were manufactured at the Fisher Tank Arsenal. Tests at Aberdeen Proving Ground ran through January 1947. The project was later canceled, with some vehicles going on to be used as target practice. The M26 would, of course, go onto to be upgraded numerous times up to its replacement by the M48 Patton. The T15E1 Tank Gun was designed to be America’s answer to the deadly 88 mm (3.46 in) KwK 43 wielded by Tiger II. In January 1945, this gun was mounted on a T26E1, causing the vehicle to be redesignated as the T26E4 Pilot Prototype No.1. The T15E1 gun was 73 calibers in length, almost twice the length of the 90 mm (3.54 in) M3 Gun of the standard Pershing. The breach was also longer, with a much higher capacity chamber. Elevation ranged from -10 to +20 degrees. This gave it a muzzle velocity of 3,750 ft/s (1,140 m/s) with the T30E16 APCR (Armor-Piercing Composite Rigid) shot and could penetrate the Panther’s frontal armor at up to 2,600 yds (2,400 m). In testing, this cannon was apparently able to put a shell into a Jagpanzer IV, which went straight through the vehicle and impacted the ground behind it. This model used a 50 inch (1,300 mm) long single-piece shell. This was a very long shell and the tests made at the Aberdeen Proving Grounds showed that it was difficult to handle the shell inside the T26E4’s turret which, as in any tank, was quite cramped. Furthermore, storing the shells was also a problem. The second E4 prototype was equipped with the E2 variation of the same gun, the major difference being that it used separately loading (shell, followed by charge) 2-piece ammunition. The T15E2 was the gun used on the 25 “serial” T26E4s. A number of problems arose with the two piece ammunition. As such, and with the appearance of better designed one-piece ammunition, this version of the gun was discontinued after the war. The weight of this larger cannons necessitated better stabilization. However, for the first two prototypes, this couldn’t be achieved internally. This resulted in the addition of large stabilizing springs to the top of the mantlet for the two prototypes. In some of the photos, these can be seen without their casing. For the 25 serial produced T26E4s, an internal hydropneumatic equilibrator was installed inside the turret and the external springs were deleted. The first two prototypes were the only ones to have this feature. Logistical oversights hindered the deployment of this single tank. When it arrived at the 3rd Armored, it was missing the M71E4 telescopic gunsight designed by Slim Price for use with high-velocity guns. As such, an M71C sight, designed for the standard 90 mm gun M3, was fitted. During a second incident, a week prior, the special 50-inch shells were mistakenly shipped to the 635th Tank Destroyer Battalion. This only came to the attention of the 3rd Armored when a commander from the 635th enquired as to why the shells they had been supplied were many inches too long for their guns. 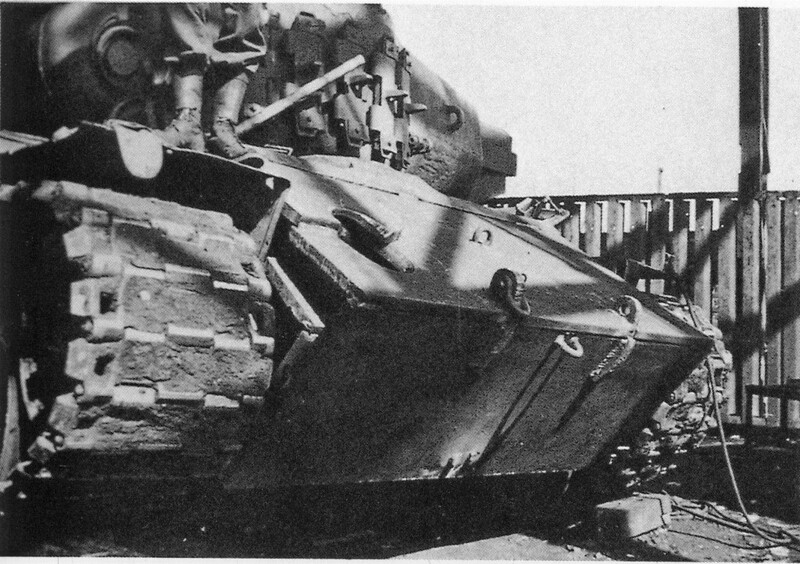 Major Harrington, Chief of Tank Repair Service to the 3rd Armored Division, did not want to lose the vehicles in their first deployment, and as such approached lieutenant Belton Cooper, who would later go on to publish the book ‘Death Traps’, to look into the possible up-armoring of the vehicles. The M26 Pershing was designed to fight the heaviest armor the Germans fielded, be it Tiger or Panther. The M26 did suffer from a very weak mantlet, however, with an 88 mm shell from a Tiger I’s KwK 36 able to go straight through. It would be even less of a match for the Tiger II’s KwK 43. As such, Lt. Cooper chose a crude, but effective method of up-armoring the tank. Engineers salvaged an 80 mm (3.15 in) CHF (Cemented Hard Face) frontal plate from a destroyed Panther and welded it straight on to the mantlet. Holes were cut on the left and right of the gun so the gun sight and coaxial .30 cal machine gun could still be used. Additional, overlapping plates were also welded to the forward hull of the tank, creating a crude spaced armor. Later on, more armor, in the form of “ears”, was also attached to the mantlet plate. A large counterweight was also added to the rear of the turret bustle. The T26E4 Pilot Prototype No.1 “Super Pershing”, without the “ears” – Illustration by David Bocquelet. This veritable Frankenstein of a tank was only recorded to have been in action twice. The first action took place between Weser and Nordheim where it destroyed an unidentified armored target. The second action comes with slightly more detail. In the city of Dessau, on April 21, 1945, as the 3rd Armored Division advanced, the tank was engaged by what was widely believed to be a Tiger II. The enemy tank fired one shell at the Super Pershing which ricocheted. The Pershing returned fire, penetrating the lower plate of the Panzer, causing the ammunition to explode and the turret to fly off. This story was told by Gunner Cpl. J. Erwin, and has been scrutinized over the years as to its authenticity. For one, the nearest Tiger II equipped unit was the SS 502nd Heavy Panzer Battalion and was 70 miles from Dessau. Second, as many larger German tanks were mistakenly named Tigers by the Allies, it is highly likely that it wasn’t a Tiger at all, some reports stating that was merely a Panzer IV. There is some confusion about the designation of the first prototype that was also sent to Europe. Hunnicutt, in his book, states that, after being upgunned, the vehicle received the designation T26E4, temporary pilot No.1. This is almost assuredly the correct designation for the vehicle that was sent to Europe. The T26E1-1 denomination is probably the most common mislabel. It comes from the fact that the earliest images of the first prototype show it having “T26E1-1” written on the side of the turret. 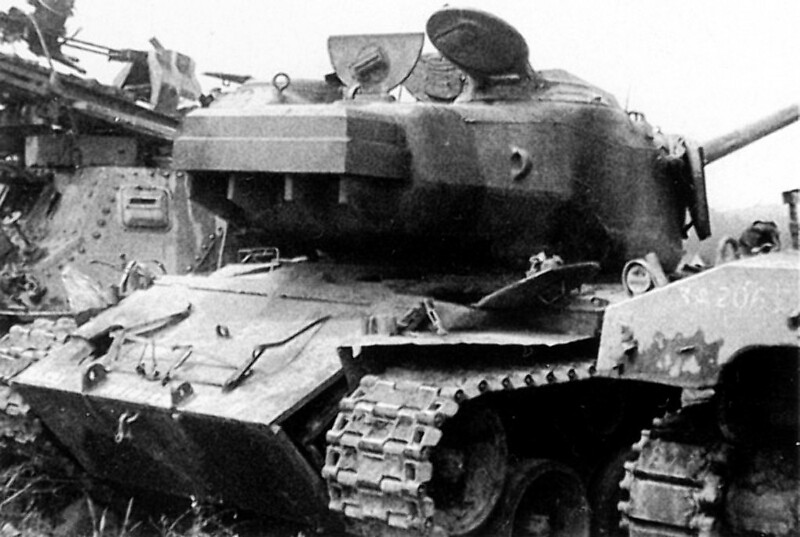 The vehicle was, indeed, the first T26E1 prototype, which is where the writing on the turret originated. The writing was not modified when the vehicle received the new gun. T26E1-1 is not the designation of a new type of vehicle, but how the first T26E1 prototype was labeled. Below, the T26E1-1 vehicle can be seen before receiving the T15E1 gun. The T26E1-1 vehicle on a tank transporting trailer. This is a photo of the vehicle before it was modified to take the T15E1 gun. It is a normal T26E1 in this image. The T26E1-1 label can be clearly seen on the side of the turret. There are no known instances where a US tank type received such a designation with a hyphen (“-“). This was a way to designate individual vehicles, as in the 1st built vehicle of the T26E1 type. What is unclear is why the T26E1-1 label was not removed from the turret when the changes were done or if the redesignation to T26E4, temporary pilot No.1 was made after the photos were taken. Another denomination that is often presented is T26E4-1. This can be taken to mean T26E4, temporary pilot No.1. However, this vehicle was not a regular T26E4, but a temporary pilot. Furthermore, there is no evidence of this designation being used historically or officially. The last and worst offender on the list is the M26A1E2 designation. This denomination makes no sense whatsoever. The M26A1 was a version of the M26 with an M3A1 gun. The M26E1 was an M26 with a T54 gun. The M26E2 was an M26 with a better power pack (which lead to the M46). There is no proof of the M26A1E2 designation ever being used historically or officially. Thanks for the article. Three things to point out — the T26E4’s rear bustle counterweight was added in the States and not by the 3AD maintenance crews. Also John Irwin claims three tank engagements in his memoir “Another River, Another Town” while he was the gunner of the T26E4. Lastly, only the added slab to the mantlet was cut from a Panther — the other pieces were boiler plates found by the 3AD fitters. In the specifications box, the crew heading is incorrect. The number says there 5 crew members but the list only cites 4, a commander (1), driver (2), assistant driver (3), and loader (4). I am most definitely not an expert on the Super Pershing, but I noticed that error and just wanted to point it out. Amended, thank you for pointing that out. Scrapped at Kassel?! What a shame. Shoulda put it on display at Fort Sill or someplace. what are the tubes on top of the turret for? I have been curious about this for along time. These are used in conjunction with the weight on the turret bustle as a counter-balance for the rather large gun. I would like to clarify the ‘Armored Ears’ caption if I may? My understanding of Belton’s description of these ‘Ears’ was that of a counter-weight for the guns added CHF mantlet armore forward of the (vertical) pivot point rather than ‘additional side armore’ which is suggested here? It is obvious that the standard version of the Pershing’s turret was already on it’s limit to balance the long barrel hence the external overhead spring system which seems like and afterthought already. We must also consider the turrets traversing forces when on a steep gradient. Maybe these ‘Ears’ would help to counter those forces if(?) they were behind the center of rotation of the turret? I would like to express my love and best wishes to Belton’s family particularly as I am an English Guy living in Normandy, France. There is never a day that goes by when I don’t think of the sacrifices made by the likes of Belton and his friends! Much love to you all. if a shell penetrates the bottom of a Tiger II and explodes the following explosion will ignite the ammo in it’s ready rack and set off the main ammo locker which was usually open for easy access. Zaloga, on Pershing “Though the new tank would never meet its intended nemesis, it did enter combat on 4 April along the Weser River, firing its main gun only once, yet destroying an enemy tank (likely a Panther or Tiger 1)from approximately 1400 meters” . Clearly he is unsure of the correct identification of the engaged vehicle, at 1400 metres a late Mark IV could be misinterpreted as a Tiger. The standard Pershing performed excellently against panther and Tiger 1, after the first encounter by Fireball. There are interesting reports, early 1945 on the positive morale impact of the Pershing within the Armoured Divisions. These are similar to the British reports on the morale impact of Firefly. Sadly Pershing was to little to late. They should have built the 90mm Sherman as a stopgap as Firefly was for Comet and the ultimate solution Centurion. Easy to say in hindsight but it would have saved US solider lives. It says crew of 4, loader, driver, assistant driver, commander but what about the gunner? The 90mm Sherman was done. A sample vehicle was built (see Zaloga Osprey series). The M4 Sherman with T26 turret would not have arrived any sooner than the T26E3 tank, and would have resulted in an inferior tank that would have slowed production of the T26E3 tank. So the 90mm Sherman was cancelled.